This article contains resources and answers to many of our most frequently asked questions about our integration with Marketo. If you have any questions about how to integrate with Marketo, read this article. It says I'm not connected with any Marketo instances but I'm connected in the app center! Why? Navigate to Content Types and Workflow under the settings wheel on the left navigation bar. Select the pencil icon for the content type they are using for Marketo. Add the Marketo integration and a primary destination. I tried to connect to Marketo in the App center and the integration did not work. Why? The user needs to be a full user, not an API Only user. This will prevent any errors if your password expires. The user MUST have access to the "Web Services" page in Marketo for your integration to work. You can find this by going into your Marketo instance and going to Admin -> Integration -> Web Services. If your user does not have access to this page, consider upgrading them to the admin level or switching to a different user. Read about how to integrate with Marketo here. I am a full user and I have access to the Web Services page in Marketo and I still got an error when trying to connect! Why? Marketo employs a 2-step authentication process if it does not recognize your computer. 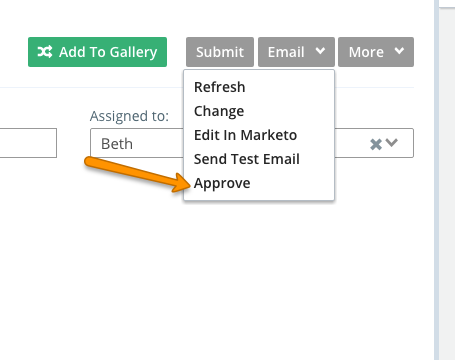 The first time you try to connect, it will fail, but if you click Edit next to your integration you will see a field where you can enter an authorization code that Marketo sends you by email. Read about how to integrate with Marketo here. How do I mark a Marketo asset as published? Kapost considers a Marketo asset Published when you click Approve, which is located in the Email dropdown menu. This approves the asset in Marketo as well. How do I get analytics on a Marketo landing page? Once your Marketo Landing Page is approved, it will start pulling in analytics. You can read more about them here. I approved the landing page in Marketo but I'm still not seeing analytics. Why? You need to be hooked up to Google Analytics for Marketo analytics to work. Learn how to integrate with Google Analytics here.